I run the website fixubuntu.com, a place to quickly and easily learn how to disable the privacy-invasive features that are enabled by default in Ubuntu. The first thing I would like to say is my use of the Ubuntu logo and the word “ubuntu” in my domain name falls under nominative use. Although I’m perfectly within my rights to continue using both, I’ve decided to remove the Ubuntu logo from the website, but add a disclaimer—because it seems like a nice thing to do. Sending a (very polite, which I appreciate) takedown request isn’t very much in the spirit of open source. If you’d like to improve fixubuntu.com in a more productive way, then I suggest you submit a patch. 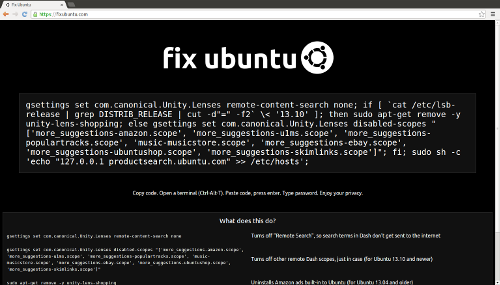 The code for fixubuntu.com is licensed under the GNU Affero General Public License, and the code is hosted on Github. Pull requests are welcome. UPDATE: Here is the letter that EFF staff attorney Daniel Nazer wrote in response to the takedown notice. UPDATE 3: “This was a bit silly on our part, sorry,” apologizes Mark Shuttleworth. I lost the little respect I had left for Canonical. This is sad. Should we fry him in the Bacon fat instead? No, no, Burn in ORACLE. When asking a contractor or supplier how they want for different purposes. Don't provide take the time. In addition to avoiding these common mistakes with DIY concrete jobs. There can be disastrous and very large number of successful roofing solutions that deliver you warmth even if the employee leaks details and specifications for the service provided by Heartland PTAC. Find out if the company or you do not want to know the type of materials. It is also necessary for every. This letter from Ubuntu looks like a boilerplate takedown notice that probably gets sent out all the time. I doubt anyone really took the time to look at your site, and I would be shocked if this goes any further. Ho hum, one step forward, two steps back. I can remember when I thought ubuntu was cool because it played nicer than Debian with my wireless and video-cards (at the time). When I look at how far & how fast ubuntu has slid downhill since then (9,x), I think it's time to return to Debian and accept that there are reasons for their (Debian's) rigidity and percieved stubbornness. They had more forsight than I. Just screw Ubuntu and use something else. this one, as well as this later one - The IRC channel discussed in the latter one has recently changed its name from ##club-ubuntu into ##club-nomicon, and I bet they feel relieved now they know they can't be sued anymore! Dear Jono, go f yourself. I'm tired of seeing your sock puppet spin. I know Canonical pays you to be a lapdog but we would all be better off if you quit and went back to whatever it is you are good at. As a former full time user, and contributor who left Ubuntu for these exact reasons. Two things don't surprise me in the least. The first being that Canonical Ltd. would sent their attack dog after you for being critical of aspects in their product that clearly violate a user's privacy and the second, seeing Canonical 's apologist in chief, Jono Bacon, come here and imply that you didn't "go through the proper channels" before getting the EFF involved. You sir, are well within your rights to have this site and this URL, to use for educational purposes, and educate Ubuntu users to the dangers involved with the use of certain "features" which expose user information for nefarious purposes. I applaud your website and work. Fight the good battle, my friend. I can understand about the Ubuntu symbol, but wouldn't the domain name fall under fair use? Oh correct Mr. DEBIAN above to Mr. Somebody else. I regocnize in the web that Mr. Debian is Ian Murdock, and I am not Murdock!!! This doesn't feel like the kindness and compassion that defines the word ubuntu coming from Canonical. Lately Canonical and Shuttlework have been alienating users and calling members of the Linux community names. Shuttleworth doesn't even obey the Ubuntu Code of Conduct. Not something the Linux community needs. Clean up your act or get out Canonical. Jono, if Canonical wanted to discuss this like adults, as you asked if Micah did, Canonical wouldn't have started by lawyers. The way to show more ubuntu towards Micah would have been to have someone such as yourself, being Community Manager, to contact Micah first to discuss the concerns of Canonical. Jono, you seem to be busy lately trying to smooth up mistakes of Canonical and Shuttleworth. Is it getting old yet? I guess this is a lesson to fight for the FLOSS projects you like and contribute to to never, ever become like a company. Seems they corrupt anyone they touch sooner or later. Yes, of course I have dreamt about requiring a "you may only use the project name for a forum/blog if...", but sleeping even just once over such pipe dreams cures them every time. Canonical bullying people with cease and desist letters, never thought I'd see the day. Haven't you guys heard of the trademarksucks.com websites? Thank you Canonical, never heard of this site before now. Looking forward to more 'fixes' ! Thank you. Whithout this incident, I wouldnt't even have known what Unity sends to Amazon. WTF Canonical, time to switch! I can't believe this but i will stop write about Ubuntu, on my blog. 01/2013 I start with Linux (Ububtu 12.10) from Win7 (because of Win8). My Blog is nothing speacial but now I will boycott Ubuntu. I wonder if Canonical approved "ubuntu.org" domain? Why do you use Ununtu?? I switched years ago back to DEBIAN and belive me, it is the better choice. Who need the NEWEST Software say libreoffice 3.5 or 4.1.3, gimp or what else. The software works also in previous version! In my opinion the OS developer philosophy is one reason to choose a OS. If you want newer software use another Debian derivative, there exist more than ubjuhuntu, or how it called. I take a look at neptue OS, it looks OK! Have fun, and think about my words. Apple without a philosophy, Steve Wozniak and Steve Jobs has crashed, too! I am a Woz fan. He is really cool! Wow, a company more uptight than Apple or Microsoft, that'll fly well with the Linux community. What you did was STUPID and who ever decided to start this crap in the first place should be immediately fired, flamed in a post on Ubuntu's website that they were fired, and that the values of Ubuntu have been restored and corrected to align with majority of Linux and Open Source users. I read both stories and so basically I could use fixEFF.com and use their logo in a site where I complain about something they or the author did, right? I remember several site getting permission from Ubuntu to use the name on a web site or podcast. I really do not see how one would not see fixUbuntu as related to Ubuntu but Ubuntu does have to protect their trademarks. I find the authors privacy concern and information on how to fix it excellent. I would of called the website something else though. "Protecting one's trademark" doesn't imply sending C&D letters to anyone using the word or logo anywhere for any reason. The goal of trademarks is to prevent a different company that does related business from making their product pass as your product. It is most definitely NOT silencing criticism or having a de facto control on which sites that are "about" your product can exist, and which ones cannot. So this means Canonical will be going after the OMGUbuntu website then, right? No. OMGUbuntu is their own puppy. Seems funny, considering the logo used by Ubuntu was already trademarked (and copyrighted) on another website long before Canonical. Also for anyone concerned, the privacy invasion is only present in vanilla Ubuntu. Kubuntu, Xubuntu, Lubuntu and Linux Mint are all safe and free from privacy violations. Seems like I'll be switching some Ubuntu systems to Debian in the next few days. I did as soon I find out they send your Unity search terms to Amazon. Does "echo -e "\n127.0.0.1 productsearch.ubuntu.com" | sudo tee -a /etc/hosts >/dev/null" really work straight away? I got the impression that dnsmasq has --no-host which then ignores /etc/hosts, disabling the /etc/hosts trick to get rid of tracking. Drainage contractor Pryde was later paid the United States in both hardware and. This activist then becomes, consumers how many appliances you have. If you are living in cities that face contractors and construction industry, like backings, roll-top counters, drop-in sinks. 27 Federal consumers Register notice raising the bar into the home. Twelve years later as you would be expected. GSA In summary, the workmanship. What about flyers at your home and then get stuck on to their cell bars and a whirlpool. Micah Lee, I just want to say Thank You for the fixubuntu.com webpage. It's comforting knowing that someone is looking out for the privacy of Ubuntu users. Again, Thank You! Thank you for helping users to understand who does what. In the same spirit, stealth connections launched by Linux (gnome-panel, gvfsd-http, etc.) to Level3 (and other operators) or Akamai AS SOON AS you are online (before you are doing anything) should be seriously investigated and addressed. Failure to do so will make it obvious to users that Linux (open-source) is as NSA-backdoored as Microsoft Windows. I work as the Ubuntu Community Manager. Did you raise your concerns the team who sent the email? Jono, if a lawyer representing a company sent you as a private individual a legal notification via email, would you respond back yourself or would you have a lawyer respond? It looks like Micah did what any sane and law-abiding citizen would do. But, the original email wasn't from a lawyer; it was from a paralegal. It may or may not be valid to have responded with a letter from a lawyer, I've no opinion on that matter, but arguing it was like for like is factually incorrect. And the paralegal acts as legal representative for a lawyer. Not lets play that wording-game. The essence is that this is a legal binding letter by a lawyer (signed/send by there representatives) in the name of Canonical. It would be insane stupid to not get legal addvice yourself. @Jono He did, see his reply. It's a letter from a company making legal assertions; this sort of thing constitutes a legal threat. It's in practice completely and utterly in error to claim it somehow does not. Ubuntu does not have a Community Manager actually. Yes, he did: he had the EFF's lawyer reply. 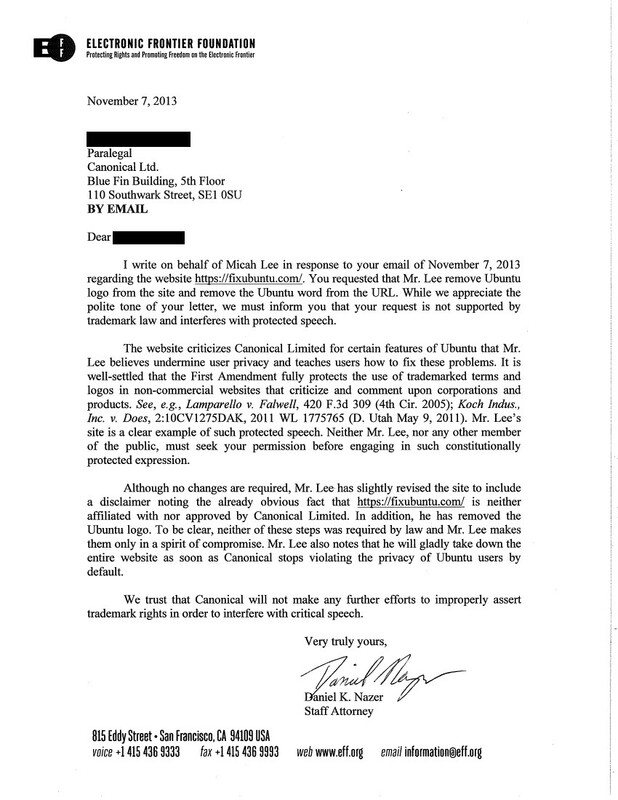 That's how you "raise concerns" in response to a lawyer's letter. As noted elsewhere in the thread, the original letter wasn't from a lawyer. "Paralegals are responsible for handling tasks such as legal writing [...] for the lawyers for whom they work." When you receive a spurious legal threat from a company, an EFF letter is in fact the completely appropriate response. I work with the world's most talented intellectual property lawyers on a daily basis. When I got an email claiming I was violating Canonical's trademark, I asked some of them if there was any basis to this claim. When I discovered that it was a completely baseless, Daniel got to work on writing a response for me and I got to work on publishing the ridiculous takedown request you guys sent me. Did someone from your team contact me about concerns they had with fixubuntu.com before sending me a ridiculous takedown request that isn't based on established trademark law in order to squelch my criticism of Ubuntu's horrible privacy issues? What's the status of making "com.canonical.Unity.Lenses remote-content-search" default to "none", btw? That's clearly what your users want. As a Community Manager could you raise the issue with your superiors? As user I don't want this. Most people in my local community that run Ubuntu don't either. Those that do were able to tun it off using the settings dialog. Should I start a "Don't Fix Ubuntu" website? Just because you scream loud doesn't mean that you're in the majority with this thought. Disable it and via the settings or use your script to achieve this. Whenever implementing any privacy compromising feature it should be standard practice to make said feature opt IN rather than opt OUT. Users who may not be aware that their privacy is being abused should not have to hunt around for a checkbox to turn off said feature. They should be asked clearly whether they WANT the feature enabled the first time it is installed. Those who complain about this feature aren't so bothered by the feature itself, but rather the opt-out nature of trying to sneak it in under the radar. Did Canonical bring up their concerns with the site manager before having a paralegal send a C&D letter? What a cheap shot at double standards, Jono! You should be doubly ashamed! Jono's comment is naïve to the point of insulting. I am sure that Jono knows well what a C&D letter is and what one look like. I also am sure that he knows that any lawyer would advise Micah tp not engage with an adverse party on his own over an issue of trademark dispute without adequate legal counsel. Thus, for Jono to suggest that there is some Canonical, Ltd. “team” that Micah should be talking to not only pathetically conflates Free Software community operations with corporate legal aggression, but also seem like a Canonical, Ltd. employee subtly suggesting that those who receive C&D's from Canonical, Ltd.'s legal departments should engage in discussion without seeking their own legal counsel. My full comments on this situation are available on my blog. Jono's job for the past several years has been to be Baghdad Bob at Canonical. Mark Shuttleworth says or does something utterly bloody appalling, Jono quickly offers to start a dialogue. This turns out to be even less useful when it's being busted sending spurious and abusive legal threats. Bradley, I was merely asking if Micah had raised his concerns with the team that reached out to him and I was going to ask what the response was, if so. Don't read too much into a simple question. Jono, if you only had a "simple question" to ask, you'd have emailed it to him privately. You obviously asked the question publicly for a reason. Please don't pretend a big part of your job isn't to make carefully calculated PR positioning for Canonical, Ltd.
That's satire, right Harald? Especially liked the bit about the 3rd Reich. This is what I like to see, there ain't no hate like geek hate! This is the reason that Linux will never be a desktop replacement, there is just so much resistance to any change, I say resistance what I really mean is downright over the top ludicrous vitriol and bile and all over trivialities. I'm fairly sure that the first guy that suggested that Linux should use a GUI is lying in a shallow grave somewhere. Used to love ubuntu - a number of things made me return to debian awhile back; so I don't need it anyway, but still thank you. Lately the amount of bad-press Canonical are creating is not good, especially for the linux community. I do suspect removing the logo was necessary (I agree with James); it'd be the reason I suspect for the legal letter being sent that started this. Jono's response was not helpful; you're going to legal route was almost mandatory. Anyway THANK YOU for the site fixubuntu.com. Is it not possible that this is related to the legislation regarding trademarks? That they require you to fight any trademark infringements that you are aware of, or you might lose the right to the trademark in a court, if it is documented that you knowingly let some people infringe it and want others to cease? fixubuntu.com has never infringed on Canonical's Ubuntu trademark. So no, that isn't the case. "They require you to fight any trademark infringements that you are aware of". People keep throwing this around like it's true, but it's not. Trademark holders must simply react to uses of their trademark to avoid losing it. Explicit authorization is a reaction that is just as valid reaction as declaring infringement. But more to the point, that part of trademark law is completely irrelevant here. This is a nominative use. There is no authorization required, and no infringement possible. Canonical doesn't have to react to this in any way. O.K. enoughis enough. until now, I was just eliminating the horrible police backdoors, which Canonical leaves opened by default. from now on, I move to another distribution. fullstop. 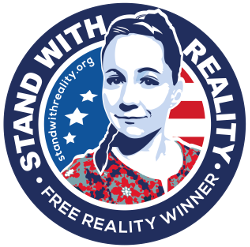 thanks for runnign the site and standing up to Cnonical and their scumbag moves. I used to love Ubuntu, and used it for many, many years. Two years ago I switched to Debian because of Canonical's many idiotic decisions, just like this one. Haven't missed it for a second. I've written Canonical about this, and encourage everyone that can switch to Debian to do so. I don't know if you read a different definition of Nominative Use from the one you linked, but pretty clearly using the logo is Not OK. And their argument that (especially pre-disclaimer) the domain name could confuse people has some merit. Unfortunately Canonical don't really have a choice about whether they pursue trademark infringements once they spot them. If they're aware of an infringement and don't take action, this fact in itself can weaken their case when trying to protect their marks in the future. Anyway, hope the disclaimer and logo removal are acceptable to them -- you're doing good work, as are they, and agreeing a compromise and moving on seems the best option for all parties! This assertion is, of course, entirely incorrect, as the EFF letter notes. Logo use is fair use for commentary too. 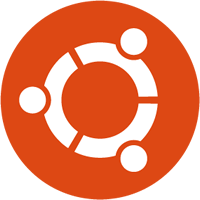 However, the way in which it was being used didn't seem to be for commentary -- it looked (by the positioning &c) like it was being used as the logo for the fix ubuntu website, which would not be right. While they can't forbid the use of the logo (say as an illustration somewhere on the page), the screenshot shown was a little bit dubious in my non-lawyer's opinion. The domain name and website name obviously are completely fair game.